NPMMU-National Pirogov Memorial Medical University, Vinnytsya is a Medical University of National Status in Ukraine. 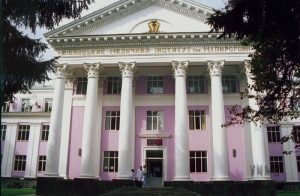 NPMMU Vinnytsya is one of the oldest and leading medical higher institutions of Ukraine and former USSR. National Pirogov Memorial Medical University was founded in the year of 1805. NPMMU Vinnytsya, is one of the largest in the country offering MBBS program, having the widest range of BSc opportunities in the Ukraine, postgraduate programs and clinical training. NPMMU Vinnytsya, has all the clinical facilities, teaching laboratories, lecture theaters and libraries. This infrastructure, dedicated team of internationally acknowledged world leaders and of highly trained technical staff, provides the ideal learning environment for medical students. There are foreign students in the universities studying from over 86 countries. Students from Denmark, Sweden, Malaysia, Bulgaria, Mauritius, India, Pakistan, Maldives, Kenya, Angola, Tunisia, Nigeria, Cameroon, Canada, Egypt, U.S.A, Saudi Arabia, Australia, U.K, Singapore, South-Africa, Lebanese, New-Zealand, Iran, Iraq, Sri-Lanka, Zimbabwe, Ghana, Maldives, Nepal, Palestine, Tunis, Uganda, Venezuela, Peru, Yemen, Tanzania, Lebanon, Morocco, Lesotho, Ghana, U.A.E, Bangladesh, south Africa, Nepal, Bulgaria, Israel, China, Norway, Kuwait, Zimbabwe, Jordan, Saudi Arabia, Uganda, Zimbabwe, Vietnam, Sierra-Leone, etc. study in the University. There are 3 educational buildings, modern equipment, research centre and centre of new information technologies, more than 600 modern computers connected to Internet, large library (500,000 books), own printing house. At the university 5,500 students are trained, including 1,050 of foreign students. In total about 40,000 doctors, among them 2,000 specialists of the highest level, possessing the Candidate’s and Ph.D., M.D. degrees, including more than 6,500 foreign citizens from 93 foreign countries (Europe, Asia, Middle East, Latin America, Africa) have been trained. Annually the University chairs issue 10-12 text-books of methodics and other educational-methodical materials for the foreign students. The activity of the University on training doctors among the foreign citizens, international collaboration and international relations are coordinated by the Vice-Rector for international links. In the structure of management of the international citizens’ education function, the department for international links the dean’s office of the preparatory faculty and the dean’s office for undergraduate and postgraduate international students. Since 1977 the education of the foreign students is carried out at General Medical and Paediatric Faculties, since 1994 – at Dental and since 2000 – at Pharmaceutical Faculties. The curricula of clinical disciplines chairs also take into account specific features of regional diseases in different countries of Asia, Africa, Latin America. The fundamental preparation at the university’s chairs ensures the foreign graduates successful passing of internship both at the University, and medical institutions abroad. All our educational programs are regulated and approved by the Ministry of Education and Science of Ukraine and the Ministry of Health of Ukraine. The degrees and diplomas issued to graduated foreign students by the National Pirogov Memorial Medical University are legalized by the Ministry of Heath of Ukraine and Ministry of Foreign Affairs of Ukraine. National Pirogov Memorial Medical University is recognized by the World Health Organization (WHO). National Pirogov Memorial Medical University is recognized and listed in the International Medical Education Directory (IMED). This accreditation allows the National Pirogov Memorial Medical University to be eligible to take the United States Medical Licensing Examinations (USMLE) and enter Postgraduate Medical (Residency) training in United States. IMED accreditation is recognized by the Education Commission for Foreign Medical Graduates (ECFMG) and the Medical Council of Canada (MCC) for eligibility of graduates to obtain certification and Licensure. The students and graduates of National Pirogov Memorial Medical University are eligible to participate in the United States Medical Licensing Examination & receive ECFMG certification. The ECFMG certification requires all graduates to have passed USMLE Step 1 and Step 2 (both sections), submit a final transcript, and provide a copy of the graduate’s diploma for verification. Once ECFMG certification has been granted the graduates are eligible for Postgraduate Medical education (Residency Training) in the United States. All prospective and current students who wish to practice in the United States are encouraged to educate themselves on the licensure policies in their respective states. This information can be obtained by going to the Federation of State Medical Boards of United States (FSMB) website or contacting them. National Pirogov Memorial Medical University is recognized by the Indian Medical Council, Pakistan Medical and Dental Council, European Council of Medicine and General Medical Council (limited Registration) of UK. National Pirogov Memorial Medical University has a joint researches and partnership relations with many Scientific Institutions of former USSR and all over the world, such as The Poland Medical Academy, The Cambridge University, The Virden University, Clinics of Urgent Medicine in Germany, Belgium, Austria and Israel. Medical center of Cardiff (England), Medical Center in Sent-Etien (France), New York Medical Center, Ukrainian Medical Society in Canada and Austria. During the last years our staff had an opportunity to work abroad as specialists and teachers in the Universities of USA, Yemen, Germany, UK etc. National Pirogov Memorial Medical University is proud of the fact that its staff were the scientists whose contribution to the world Medical Science has been commonly acknowledged. In the other sites where the National Pirogov Memorial Medical University are added: National Pirogov Memorial Medical University is listed in the free encyclopedia KNMU, National Pirogov Memorial Medical University is listed in the international colleges and universities list ICU, National Pirogov Memorial Medical University is listed in the Geneva Foundation for Medical Education and Research, National Pirogov Memorial Medical University is listed in the student exchange in Spain & abroad, National Pirogov Memorial Medical University is listed in the college abroad and in many of the faculties and schools worldwide. The Preparatory department for Foreign Citizens of Vinnitsya National Pirogov Memorial Medical University was opened in 1979 with the license to intake 450 students per year. During the period of its existence 3,552 foreign specialists from 93 countries Asia, Middle East, Africa, Latin America, the USA and Europe have been trained. The Preparatory department for Foreign Citizens is an educational subdivision of the University. It carries out the pre-university training of the foreign citizens for further getting education at the Vinnitsa National Pirogov Memorial university and other higher educational establishments of Ukraine. The Preparatory Department trains foreign students according to medical-biological direction and gives basic knowledge for entering Medical, Stomatological, Pharmaceutical department and gives special language preparation to post-graduates according to the conception of pre-high school training. Training carried out during the one year is realized according to the educational plan and curriculum of Ukrainian, Russian, Mathematics, Informatics, Physics, Chemistry and Biology. Learning the language and fundamental subject training assist the correlation of the system of knowledge on different subjects and provide the students with the language as the instrument of getting knowledge. Final control is provided in the form of examinations. Graduates of the Department who passed their exams successfully get the Certificate (of the prescribed pattern) fixed by the Ministry of Education and Science of Ukraine. The Certificate gives them the right to continue their studies at the Vinnitsa National Memorial Pirogov University and other higher educational establishments of Ukraine. The quantity of the students in a group is 5-6 persons. All the students of the Preparatory Department are provided with the necessary manuals and textbooks by the University Library. The training process at the Department is carried out by two chairs: the Russian and Ukrainian language chairs and the Natural Science Chairs. The is one professor, some readers and senior teachers among 54 teachers of the Department. The training process is held in 20 well equipped classes. The students make use of the library, reading halls and sport complex of the university. The are canteens and buffets at the Preparatory department and in students’ hostels. There is also Medical Centre where the students can have first-aid help if required. The students of the Preparatory Department live in modern hostels that correspond the present-day medical demands. At the preparatory faculty the atmosphere of confidence between the teachers and foreign students is created. The graduates of the preparatory faculty are admitted to the first year of studies at different faculties of VNMU. In total more than 4,000 foreigners from 62 countries of Europe, Asia, Africa, Latin America completed the course of study at the preparatory faculty. In their leisure time foreign students take part in excursions, parties, concerts, meet famous people of the city, become acquainted with the educational system of the Ukraine. They go to the kindergardens, schools, colleges, universities. They also visits theaters and museums. Physical training is included in the curricula of all faculties. Besides the students attend various sports sections; play football, basketball and volleyball being members of united university team on the championship of Ukraine among medical universities. The gymnasiums, grounds are given free of charge. During national holidays and festivals, the foreign students acquaint the staff of the University, population of our city and state with their national art, they organize the exhibitions and quiz games, which tell about the history, culture, traditions of their home-countries. Traditional on such celebrations is tasting of the dishes of national cuisine prepared by the students. The representatives of embassies, firms of the foreign countries in Ukraine participate in realization of celebrations.